The MDU™ (Mobile Disinfection Unit) is the right choice for medical, clinical, institutional, veterinary or hospitality use. The MDU™ Mobile Disinfection Unit is finely tuned to treat odors associated with bacterial, viral and mold contamination. 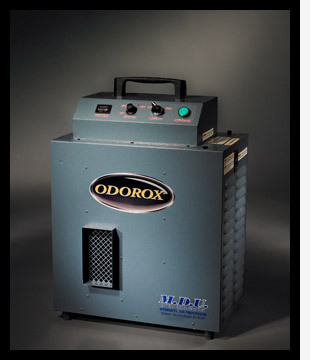 The ODOROX® MDU™ is designed to decontaminate up to a 2000 sq-ft. space. It is equipped with a selector switch for 1 or 2 ODOROX® hydroxyl generating optics, variable speed fan control, hour meter and a washable filter. ODOROX®, MDU™ and HGI Industries Inc. are either registered trademarks or trademarks of HGI Industries Inc. of Boynton Beach, Florida USA. Other trademarks are pending in the U.S. and other countries.